Our Happy Camper tent theme boutique layered bow is simply adorable. It features a multi-colored tent and camping theme print ribbon layered over a 4 inch pink grosgrain ribbon hair bow and accented with a turquoise knotted ribbon center. The bow can be attached to a clip, headband or barrette and all bows are hand sewn and made with attention to detail. We are always happy to customize our bows. If you would like this bow in a different color scheme, please message our shop! The finished bow measures approximately 4 inches wide. When ordering a headband, please message us to indicate what color and size are needed. *Lined Clips are ribbon lined alligator clips. 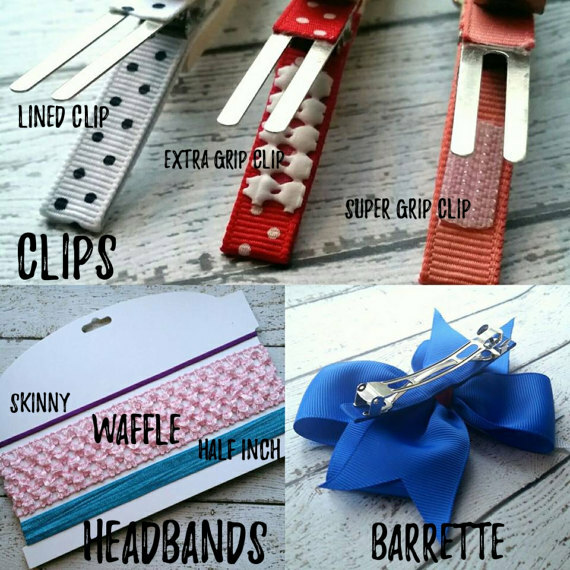 *Extra Grip Clips have a foam strip attached to help the clip hold in fine hair. *Super Grip Clips have a strip of hooks attached to give even more hold. *Headbands are available in the following colors: White, Black, Ivory, Red, Light Pink, Hot Pink, Light Purple, Dark Purple, Light Blue, Dark Blue, Light Green and Brown. *Barrettes measure 3 inches long. Please be advised that bows may contain small parts and babies and children should always be supervised while wearing hair accessories. By purchasing any of our products, buyer assumes all responsibility for its use, and understands that small children should never be left unattended while wearing hair accessories.